The Holiday Inn Binghamton-Downtown is a high rise Hotel and Conference Center located in the heart of the downtown business district. Conveniently accessible from all major highways. Nestled on the confluence of the Chenango and Susquehanna Rivers this recently renovated hotel offers a choice of river or city view rooms. The hotel is across from the Broome County Veterans Memorial Arena and close to the Ross Park Zoo, Roberson Museum, Mets Stadium, Oakdale Mall, and various local restaurants. 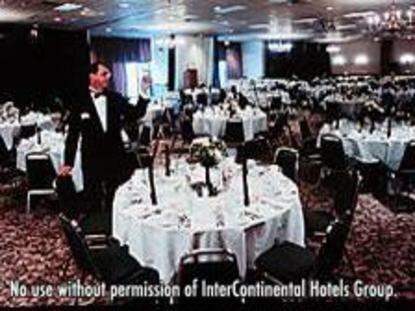 Hotel offers 237 guest rooms to include kings, two double beds, suites, and a Jacuzzi suite. Special in room amenities include free wireless Internet coffee maker, iron and ironing board, voice mail, and hairdryer. Hotel features include smoking and non-smoking rooms, 24 hour business center, fitness room, and complimentary morning paper. P Buwsiness Crowley Foods, Hinman Howard & Kittel, Security Mutual, & UniversalHospitals: Wilson, Binghamton General, & LourdesUniversities: Binghamton University, Broome Community CollegeWith a variety of amenities and a courteous staff waiting to make your stay memorable the Holiday Inn Arena is "always the place to be." This hotel is committed to providing accessible facilities under the American Disabilities Act. If your accessibility needs are not met, please contact the Hotel Manager on Duty. Should you require additional information regarding accessible facilities for guests with disabilities, please call 1-800-Holiday (U.S. and Canada) or contact the hotel directly. For the hearing impaired, TDD service is available at 1-800-238-5544 within the U.S. and Canada.